Did you know that those over-ripe bananas sitting on your counter are good for more than just banana bread? 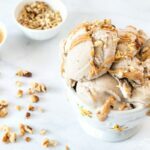 If like me, you want to indulge in a creamy frozen treat without all the guilt, then this 1 ingredient frozen banana ice cream is the perfect recipe for you. There’s nothing better than ice cream in the summer right? And while there are better-for-you options out there now (dairy free, low sugar, etc.) the majority of them still contain added ingredients that I don’t want to be consuming or I don’t want my kids consuming – (I’m looking at you sugar alcohols!). This one-ingredient frozen banana ice cream is actually good for you since the only ingredient is bananas. But it’s so easy to make that I almost considered not posting about it! I discovered this recipe about 5 years ago and I’ve loved its simplicity ever since. PLUS, banana ice cream is not that easy to come by in the States (as least not in New England) and since it’s my favorite ice cream flavor, this really is a great recipe for me. Anyway, here’s a little video that will hopefully get your tastebuds tingling and help give you a better sense of just how creamy this ice cream recipe actually is! So, I say “recipe” but really if you can cut bananas and put them in a blender, you can make this banana ice cream. I have a Ninja blender that I love but a Vitamix or other high powered blender is perfect, too. You don’t need an ice-cream maker or any other fancy gadgets. Place in a freezer bag or airtight container for a minimum of 2 hours (overnight is perfect). Once frozen, put them into the blender or small food processor. Pulse on medium until they get to a grainy, crumbly stage. Scrape down the sides with a spatula. Continue pulsing until the bananas are thick and creamy. Pour the bananas back into your container and refreeze for another hour to two hours. Did you know that those over-ripe bananas sitting on your counter are good for more than just banana bread? If like me, you want to indulge in a creamy frozen treat without all the guilt, then this 1 ingredient frozen banana ice cream is the perfect recipe for you. Experiment with flavor profiles by adding different toppings such as nuts, peanut butter or chocolate chips. Slice the bananas and place in an airtight container. Place the frozen bananas into a blender and blend until they start to become creamy. Scrape down the sides as necessary until the desired texture (think soft serve) is achieved. Using a spatula, transfer the ice cream back to the air tight container. Freeze again for at least another hour, until the ice cream is set. Serve as is or with toppings such as nuts, Nutella, peanut butter or chocolate chips. Delicious recipe. Thanks for sharing with us!